wn. I have tried so many .. I mean SOOO many different types of spot treatment that I feel like my skin is growing immune to each product quicker and quicker. I usually have two different ones on hand just so I can switch between the two. The last one that I finished was the Mario Badescu spot treatment. (Which I would probably repurchase in the future). So it comes time to start researching for a new one. 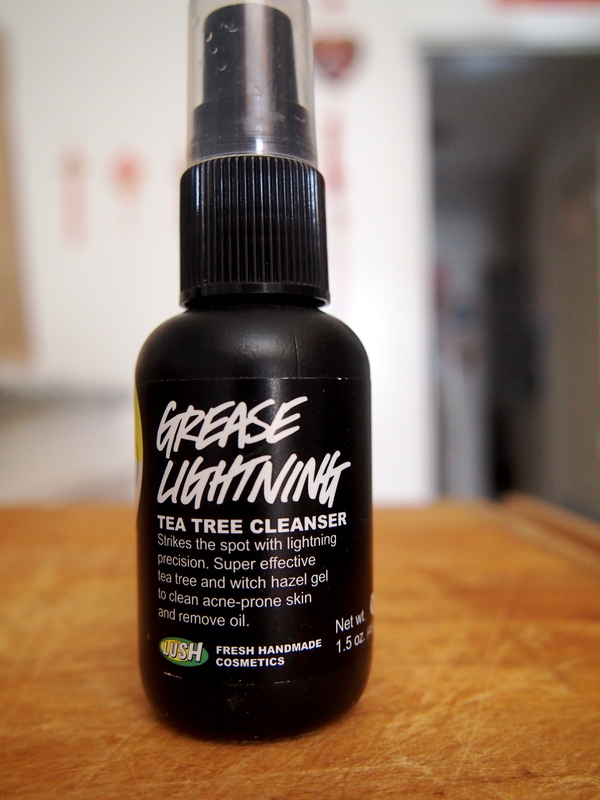 With this in mind, I have already heard of great reviews on the Lush grease lightning spot treatment. It’s made of primarily tea tree oil. Which I have tried before as well. I have found that tea tree oil works at its own pace. It’s not something that will zap everything away overnight. After the first couple uses of this, I didn’t really think it was that great of a product. Honestly I didn’t see it doing much for my skin. But I have been using it for about a month now, and I have to say, it’s a bit slower at getting rid of your breakouts, but it leaves no scar. Really. I didn’t think too much about it until today. Now that I really think about it, the last couple of times that I’ve used this for breakout, my skin has healed with close to no scar compared to normal (I scar really easily. Regardless if I pop it or leave it). The packaging is nice because it does have a pump dispenser so its a lot more sanitary. The product is a clear watery gel consistency. It claims that it will prevent break outs. I’m not too sure about that because I still break out quite regularly . But of course, most of my breakouts are probably due to hormones or lack of sleep. Wouldn’t hurt to give this a try if your in the market looking for a new acne spot treatment.